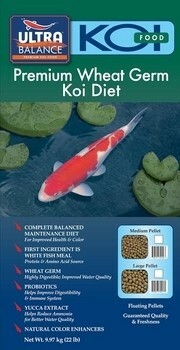 ULTRA BALANCE WHEAT GERM KOI DIETs are color enhancing floating pellets containing high quality ingredients to optimize the growth, heath and performance of you Koi. White Fish Meal - High quality protein and amino acid source to promote growth & health. Spirulina- Single most effective natural pigmentation source. Krill - Natural source of B-Carotene & Astaxanthin for red pigment. Alfalfa Meal - Natural source of yellow pigment. Stabilized Vitamin C - Maintains immune system. Exclusive Vitamin & Mineral Premix - Completet source of vitamin A, D, E, K, B1, B2, B12, Cholline and Folic Acid - To promote health and?growth of your fish. Diamond V Yeast Culture - Improves overall immune responce, increase disease resistance, and improve digestibility. No artificial colors or dyes - Extruded Floating Pellets maintain water clarity for the enjoyment of your pond.